This super cute photograph of bridesmaids at the South Coast Botanic Garden in Palos Verdes, is one of my favorite photographs from this wedding. Anytime I'm photographing a wedding party, the quality of my images is influenced greatly by the personality of my subjects. Sometimes the wedding party is reserved and sometimes they are boisterous and sometimes they are happy and sometimes they are bored. 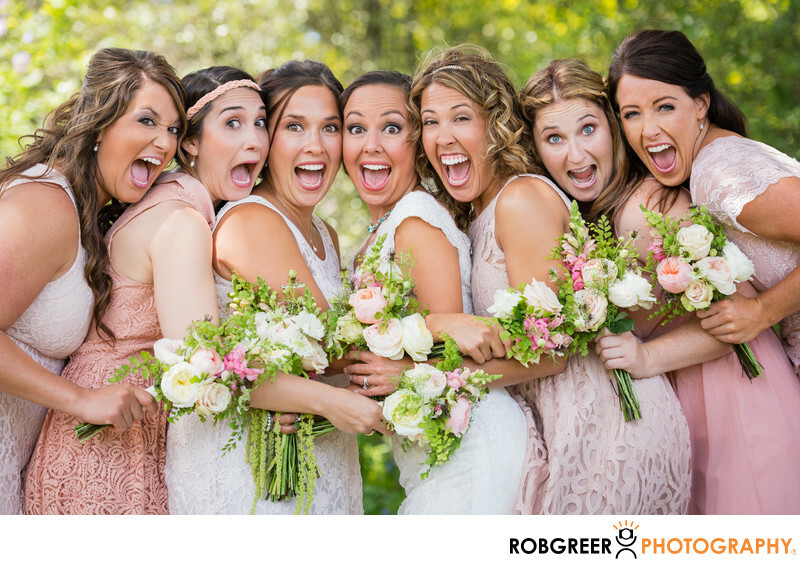 This group of bridesmaids were simply joyful. Although the South Coast Botanic Garden is an amazing wedding venue and a particularly nice location for photographs, there are not many areas near the entrance that are suitable for my style of portrait photography — photography that often depends upon open shade. However, I did find one sliver of shade under a tree that worked really well. For this image, I would've preferred a darker background that wasn't in direct sunlight but as a wedding photographer we aren't always presented with perfect situations. In terms of the posing scene here I've seen many photographers try to emulate my style of posing this bridesmaids photo, but they never quite succeed. There are elements that make this kind of photograph unique and loved by my clients, but I will not draw your attention to that here as other wedding photographers read these descriptions in addition to my clients. South Coast Botanic Garden is located in Palos Verdes, California. Keywords: South Coast Botanic Garden (9). 1/640; f/4.5; ISO 400; 112.0 mm.